Many people feel it’s safer to ride their bike on the sidewalk. Others would rather ride on the road against traffic, or ride with traffic but hug the curb. The reasoning behind each approach is completely understandable. Would you like to explore the facts behind these approaches? After all, riding on the sidewalk keeps us out of the roadway. Riding against traffic lets us see approaching traffic clearly. 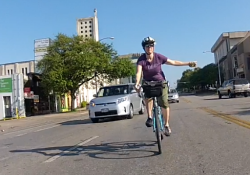 Cycling next to the curb keeps us further away from vehicles approaching from behind. Here’s where we’d like to introduce the concept of ‘perceived risk’ versus ‘actual risk’. As with many things in life, often those that aren’t dangerous are portrayed (and perceived) as being frightening. Conversely, many things that are dangerous are presented to us as being quite safe. Spend a minute or two considering some of the activities or products that might fall into each of these categories. Where is the safest place to ride? If you were riding on the road and were trying to hide from traffic, would you ride further to the right, or further to the left? In courses for all ages, we constantly get a response of “you’d ride further to the right”. Do we want to hide from traffic? Here’s a hint: the vast majority of collisions occur when a driver simply does not see a cyclist. See our posts below (or under ‘Traffic Skills’ in the ‘Resources for Cyclists’ menu above) for proven tips on safer riding in a number of situations.